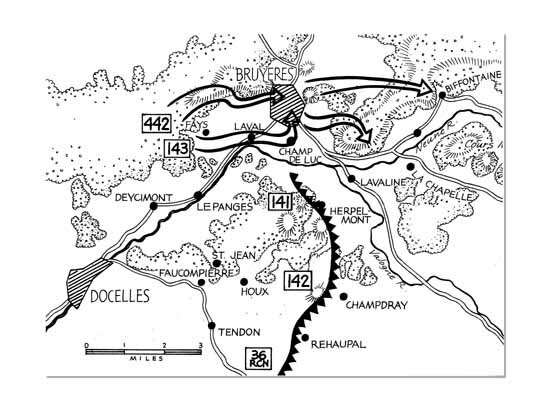 The additional strength of a fourth regiment (the 442nd) made possible the launching of an attack to seize Bruyeres, important road center and key to the heights overlooking the Meurthe River. 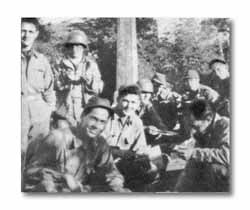 The 442nd assembled in the woods northwest of Fays and was given the mission of attacking down a heavily wooded high ridge to capture the north edge of Bruyeres on the heights north of the city. The 143rd, which had been pulled out of the line on the 13th, was assembled in the vicinity of Fays and given the mission of capturing Laval, Champ de Luc and the southern half of Bruyeres. The 442nd filled the gap between the 36th and the 45th. This was the first time since the August 15 landing that solid contact was established with friendly troops on both flanks of the Division. It took three weeks to push the seven-and-one-half miles of shell-raked road from Docelles to Bruyeres. The attack began October 15. On the right, attacking across open ground with splendid artillery support, the 143rd captured Laval on the 15th and Champ de Luc on the 16th. The 442nd, in thick woods, had slower going. For three days it struggled forward against violent opposition. By nightfall of the 17th, however, it was on the heights west of Bruyeres. The next morning a coordinated attack launched by the two regiments swept through Bruyeres, by then a town of battered roofs and debris strewn streets. 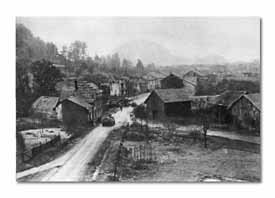 The Germans held onto the encircling hills to the east and shelled the town and its approaches in bitter protest over their loss. But the Nisei, not to be stopped, clambered up the almost perpendicular slopes of Mt. Avison, 1800 feet high, northwest of the city and drove through to the railroad east of the height. Although Bruyeres was captured, it was of little value until the enemy could be driven from the heights from which he kept shelling the city. A small task force of the 36th Reconnaissance Troop and a company of tanks from the 753rd Tank Battalion under Lt. Col. Felber was therefore sent to capture Belmont and protect the left flank while the 442nd was directed to drive across Boremont Ridge and capture Biffontaine. The Germans tried desperately to hold along the railroad track and lower slopes but the 442nd, held up for a day, sent a flanking force around the German left and by the 20th had advanced over the ridge, towering over 1800 feet high, seized Biffontaine, and made Bruyeres secure. Anti-tankmen of the 142nd pause to warm their C-rations before hauling ammunition. 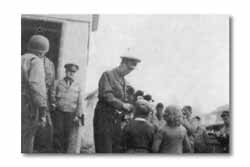 Army Chief of Staff George C. Marshall and French friends at the 36th Command Post in Docelles. General Marshall had visited the 36th in Italy, too. A stinging defeat had been administered to the Germans. In a weeks fighting 645 had been captured and at least an equivalent number killed and wounded. The Corps commander decided that German strength west of the Meurthe River had been so badly shattered by the 36th Division attack, that now was the time to make an all out push to reach the Meurthe River from St. Die to the north. The 3rd Division, which had been withdrawn from the line ten days previously, was committed to attack down the Les Rouges Eaux valley toward St. Die. The 36th, holding an ever increasing front from Le Tholy to Belmont, was given the mission of seizing the long spur running in a southeasterly direction east of Biffontaine and north of the Neune River, to protect the right flank of the corps effort. Execution of this mission resulted in one of the most dramatic episodes of the warthe "Lost Battalion" of the 141st Infantry.